Slovakia's twins Pavol and Peter Hochschorner on Friday made history by winning the unprecedented third canoeing slalom Olympic gold, extending their years-long dominance in the men's canoe double (C2) event. The brothers, ranked world number one, won comfortably with a combined time of 190.82 seconds despite a penalty of four seconds for hitting two gates in the semifinal and final runs. Ondrej Stepanek/Jaroslav Volf of Czech, Athens bronze medalists and world champions in 2006, won silver with 192.89 seconds. Mikhail Kuznetsov/Dmitry Larionov of Russia took bronze in 197.37 seconds. This was Slovakia's second gold at the Beijing Games. On Tuesday, their compatriot Michal Martikan regained the white water C1 gold 12 years after he took the C1 title in Atlanta. The powerful twins, third-time Olympians, attributed their successful title defence to their experience. "We are more experienced, while the Germans are young," said the powerful twins in the mixed zone. 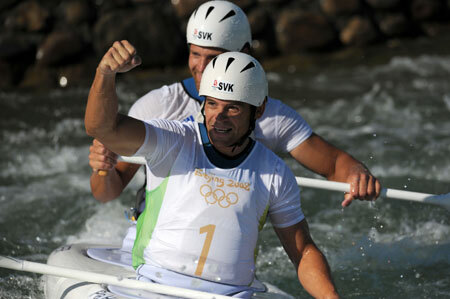 German team of Felix Michel/Sebastian Piersig failed to post a podium place at their first Olympics in spite of first finish in the semifinal.